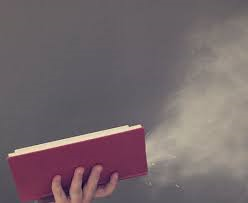 It’s Day 4 of my ‘Blowing the Dust Off’ series of blogs. Today Kirsten McKenzie is taking time out from preparing for an archaeological adventure to tell us all about the fabulous novel, Fifteen Postcards. Today I make the long journey from Auckland to Newcastle upon Tyne. Three different plane changes and one train trip will see me to my hotel in the centre of the city, where I suspect I shall then sleep for several hours. Why the long journey? I’m heading back to volunteer at an archaeological dig at Vindolanda, all in the name of research. 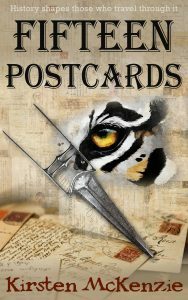 That paragraph turned in ‘Fifteen Postcards’, a historical time slip novel traversing three continents and two centuries. It took me eighteen months to write, and even then it ended on a cliffhanger as the story grew too large for just one book. 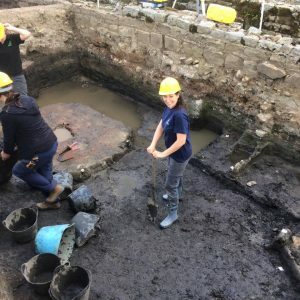 A couple of months after ‘Fifteen Postcards’ was published by Accent Press, I turned up at Vindolanda for my first experience of volunteering on an archaeological site. And I fell in love. Every shovel full of dirt felt like a treasure hunt, but the sort of hunt where you all celebrate finding shards of pottery or slivers of glass. The most exciting article I found was a chair leg, beautifully preserved in the unique environment at Vindolanda. It was that experience which dictated the direction the sequel to ‘Fifteen Postcards’ would then take. ‘The Last Letter’ was written in twelve months, and may include some references to digging up Roman statues….I’m not going to spoil the plot here! Accent Press published ‘The Last Letter’ which again had an ending which nicely morphs into another sequel. So now my first novel ‘Fifteen Postcards’ has turned into a trilogy. It did that without me even realising, but time slip fiction does that to you. There are so many interesting threads of history you can weave into a storyline that you just don’t want to leave anything out. My next book wasn’t the sequel to ‘The Last Letter’. Those characters needed to have a bit of time out, to sit around and stew in colonial New Zealand, or Victorian England, or underneath the rule of the Raj in India. While those characters were resting, I wrote ‘Painted’ a bloodless horror about an art appraiser and a houseful of malevolent portraits. Again, the antique dealer side of me couldn’t resist pulling in all the antique references. ‘Painted’ took eight months to write, so I’m getting faster which is a good thing! Now that’s out of my system I can revisit the wonderful characters from ‘Fifteen Postcards’ and ‘The Last Letter’ and maybe I’ll fling them into Roman Britain or modern day America? Who knows! But when I step onto the first plane today, I know that I will have my laptop with me, and two glorious weeks of free evenings to write in the most beautiful of locations, with very little responsibilities. And I’m imagining wonderful words will flow. For many years Kirsten McKenzie worked in her family’s antique store, where she went from being allowed to sell the 50c postcards to selling $5,000 Worcester vases and seventeenth century silverware, providing a unique insight into the world of antiques which touches every aspect of her writing. Her time slip novels have been called Antiques Roadshow gone viral, and The Time Travellers Wife meets The Far Pavilions. Her horror novel Painted was released in June 2017. Now a full time author, she lives in New Zealand with her husband, daughters, and her SPCA rescue cat, and can be found procrastinating on Twitter. Come back tomorrow to hear what the lovely Rachel Brimble has to share with us. The timing of this blog post was so perfect! Thank you.